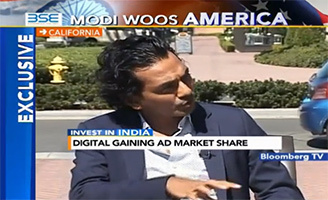 Divyank Turakhia, founder and CEO of Media.net, appeared on the US Edition of “Invest in India” and Bloomberg TV. Along with Shafi Saxena, Chief Brand Officer at News Republic, they are discussing the changing face of media, and the Indian Prime Minister’s visit to the Silicon Valley. Turakhia gives a very educating interview that sheds light on how Indian entrepreneurs approach the increasing role of India in the International markets. Siddharth Zarabi of Bloomberg TV India conducted the interview which can be viewed here.